How many times have you stepped out of your house and straight into a huge puddle on your sidewalk, ruining your shoes? How many times have you left your outdoor furniture cushions out in the sun to dry out after an unexpected rain storm? Water damage can ruin so many of our possessions; eliminate that fear with NeverWet water repelling treatments! NeverWet is designed to protect against water on a variety of fabrics, while leaving the fabric visibly unchanged, soft to the touch, and breathable. There are four fabric formulas in our NeverWet product line, each specifically designed for different purposes and styles of fabric. NeverWet Fabric is designed as the all-purpose, go-to formula for everyday use. It is ideal for backpacks, patio furniture, shoes, gloves, and more. Protecting fabrics, such as your outdoor furniture cushions, has never been easier; NeverWet Fabric’s unique formula penetrates the surface of the fabrics and forms a protective barrier around the individual fibers, repelling moisture before it can soak into the surface. There’s nothing worse than walking or running in soaking-wet shoes, and NeverWet wants to prevent it! 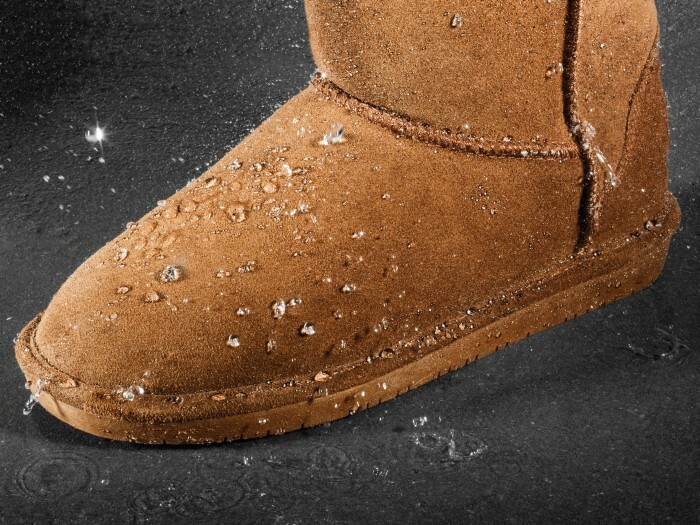 With NeverWet Boot & Shoe formula, your shoes will be protected from water, mud, and soil in any weather condition. This formula is ideal for winter boots, running shoes, dress shoes, and more! Have you ever left your car windows open at the office, only for a downpour to begin before you can get outside to shut them? NeverWet Auto Interior is specifically designed for car upholstery, floor mats, carpet, and car seats; you’ll never drive home with damp car seats again! The formula dries completely clear, protects against stains, and retains the natural look and feel of your seats. Hunting, fishing, and camping are popular pastimes, but arranging a time to go can be subject to the elements. Stay dry all weekend long with NeverWet Hunting & Outdoor formula, one of our strongest formulas on the market. Our patented Outdoor formula repels water from tents, camping gear, hunting boots, jackets, hats, and more! NeverWet Fabric Series is designed with your everyday life in mind. Our patented technology is constantly evolving for better, more effective protection; all of our formulas are equipped with our crystal-clear technology. Your clothes, shoes, car, and furniture has never been better protected from the elements. Curious about NeverWet? Visit our website at www.neverwet.com and discover the full potential of the NeverWet product line!